Step 1: From the Groups page, click the drop-down arrow after the group name and select Edit Group. Step 3: Click Submit to save the enrolment changes. 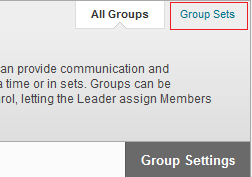 Step 1: On the Groups page, click Group Sets (top, upper right). Step 2: Click the drop-down arrow after the group set name and select Edit Set Enrolments. Step 3: For Group Set Enrolments. Decide if you will select students yourself to enrol or randomly enrol them. Rndomise Enrolments: places members evenly across the number groups listed. Members are moved from the Items to Select box to the Selected Items box. If there are more members than available groups, those members will not get randomly added to a group. So you can add additional groups (Add Group button at bottom of page) and click Randomise Enrolments again, or add the remaining members yourself. Select Members Manually: from the Items to Select box, click on the member or members (hold down the Ctrl key as you click each member or click Select All to choose all members) to enroll, then click the right arrow to add them to the Selected Items box. Likewise, to unenrol members, click on the members under the Selected Items box, then click the left arrow to add them back to the Items to Select box. As needed, you can edit the group names, delete any groups, and add more groups. To quickly add groups, click Collapse All, then Add Group. Step 4: Click Submit to save the enrollment changes.